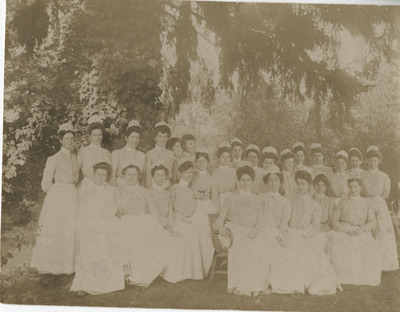 This is a portrait of the nursing students of the Good Samaritan School of Nursing, who pose under a tree on the grounds of the Good Samaritan Hospital. Unknown, "Nursing Students Under the Cedar 01" (2012). Good Samaritan School of Nursing Photographs. Image. Submission 37.